We’re two months into the summer 2016 movie season and, so far, the narrative has been one of baffling failure, with costly blockbusters (aside from Marvel and Pixar franchises) repelling audiences one after another. But look beyond the gossipy disaster stories and there’s been another trend quietly unfolding, which is the encouraging success of skillfully directed, modestly budgeted horror counter-programming. Both Jaume Collet-Serra’s shark thriller The Shallows and James Wan’s spookhouse extravaganza The Conjuring 2 deliver in spades the type of clever empty calorie thrills and bracing excitement we’ve been conditioned to anticipate from their infinitely more expensive and hyped competition. As a filmmaker, Collet-Serra isn’t exactly known for his grand auteurist ambition or innovative storytelling. However, previous efforts Orphan and Non-Stop have proven his worth as a peddler of colorful, imaginative and wildly entertaining trash that twists seemingly simple genre set-ups into something weirder and more unique. Consider The Shallows another feather in his slightly askew cap; an immersive single protagonist survival tale that is one of the few killer shark movies to land closer on the quality measuring stick to Jaws than, say, Shark Night 3D. 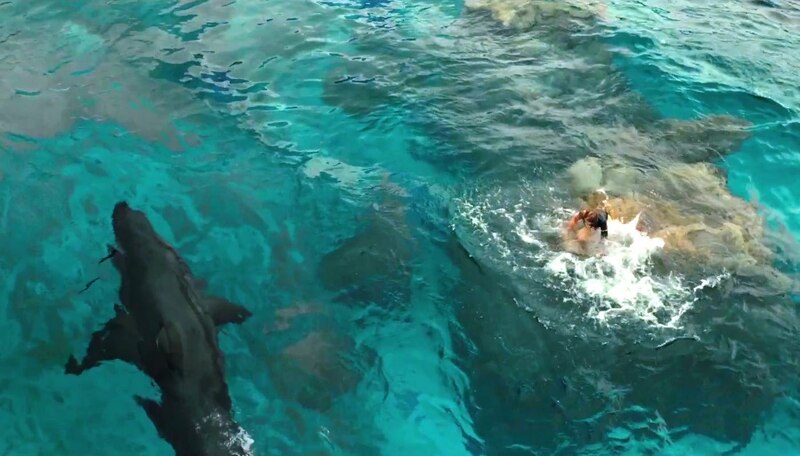 Headlined by a very game and committed Blake Lively, playing a grieving young surfer held captive a mere 200 feet from shore by an aggressively territorial great white, The Shallows is an impeccably assembled exercise in ever-ratcheting tension. The Barcelona-born director, operating with a mere 17-million-dollar budget, embraces his limitations by keeping his vicious CG co-lead obscured – a sleek, breaking fin here, a murky shadow there – much the way Spielberg so famously did back in the sunny days of 1975. And, similar to that enduring classic, or 2003’s effective Open Water, anxiety is generated by not quite knowing where the marine threat is from moment to moment. As we watch our heroine battle her way through various minor tasks, such as nasty self-surgery or travelling from a floating whale carcass to a sturdier rock, we’re always on edge, waiting for the leviathan to rise up. Of course, this being a Collet-Serra joint, things invariably get pretty bonkers at a certain point. Although this characteristic descent into cartoonishness doesn’t quite work as well here – due to the stripped down, you-are-there nature of the film – as in past endeavors, his go-for-broke dedication to cheeseball overkill is bizarrely admirable. The man is nothing if not consistent. And if he keeps cranking out B-movie fare this fun, technically proficient and well-acted (even Lively’s avian co-star Steven Seagull turns in a stellar performance), his peculiar brand of high-concept craziness will always be welcome. While The Shallows helmer has always played on the cheaper end of the studio genre flick system, James Wan – who exploded onto the scene in 2004 with cheapie shocker phenomenon Saw – hasn’t just flirted with the big time, he’s fast become a major player; pulling off Furious 7 with style, despite tragic complications, and signing on to captain DC’s Aquaman. 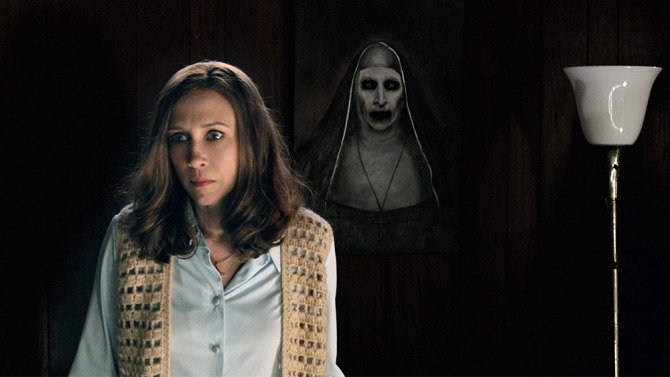 But, watching the frequently terrifying, lovingly crafted sequel to his 2013 smash hit The Conjuring, you sure can tell where his warped heart truly remains. 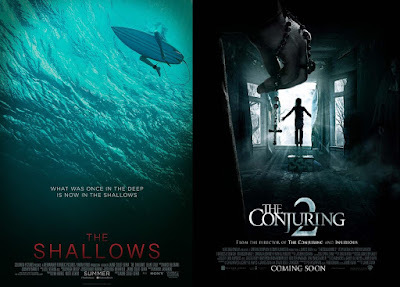 Any hack can create a cheap showcase jump scare for trailers to milk. He digs into this superior follow-up like a man possessed, infusing it with enough feverish, pulse-quickening suspense sequences to fuel over a dozen schlocky one weekend wonders. 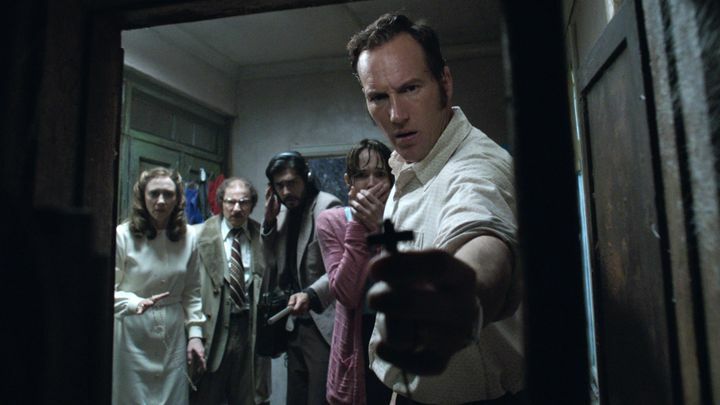 Once again drawing inspiration from the true life (entirely bogus) experiences of paranormal investigators Ed and Lorraine Warren (portrayed on celluloid by Patrick Wilson and Vera Farmiga), The Conjuring 2 tremendously fictionalizes the famous events surrounding England’s late 1970s Enfield Poltergeist case. This scenario, which begins with simple bumps in the night tormenting a woman and her four children, before gradually evolving into possession and unthinkable supernatural chaos, affords Wan a wide variety of hellish scenarios to exploit to their profoundly chilling hilt. As mysterious hands push objects out of darkened tents, chairs travel uneasily across rooms and aged specters leer, scream and leave bite marks, you can practically sense the creator grinning sadistically between the frames. 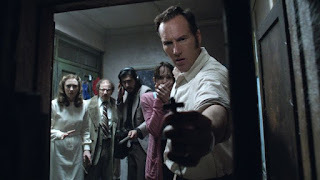 What really makes this franchise work like gangbusters – as opposed to Wan’s two genuinely solid but unremarkable Insidious installments – is the grounding presence of Wilson and Farmiga. They’re so thoughtful, warm and compelling that their very human love story is as involving as the ghastly happenings surrounding them. And because we’re invested in them, and by extension the characters they’re fighting to protect (predominantly Frances O’Connor and talented young Madison Wolfe), the building dread and traumatic frights arrive loaded with an impact that’s surprisingly emotional as well as visceral. The Conjuring 2 again shows Wan to be a formidable master of the form, a ghoulishly ingenious talent rarely better than when he’s dragging unsuspecting ticket-buyers into the horrible recesses of his most hypnotic cinematic nightmares.